Finally tried clipping for root lift! And the results are great! I decided that the whole plopping and then diffusing upside down thing wasn't working. So I changed up my routine. Now I apply my leave in (miracle 7) followed by Aussie instant freeze. Scrunch and smooth that in. Then, in a radical new move, lol, I comb it in. That way I can make a real side part. Basically at this point my hair is straight, with a part. Then I scrunch to encourage the curl and then use two long duckbill clips. The first is inserted at my part, parallel to my part, basically gathering about a cm of hair from each side of the part. Then I insert the second from the back of my head also parallel to the part. Then I diffuse. Results are very good! I now have volume at the roots and the added bonus is that the back looks better because no separation can form in the back. You know how that can look like a bald spot. Wow...It actually made a big difference! As a matter of fact...I got too much volume! haha I was all trying to calm it down. What I did was plop until my hair was about 60% dry. Then I brought my hair down and cliped my roots with pin curl pins. I clipped along where a mohawk would be except that I stopped on the back mid section of my head. 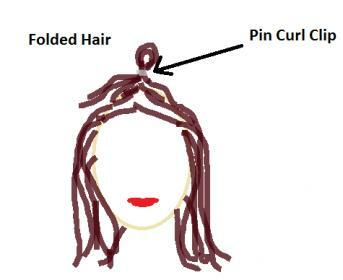 My hair is rather long so the clips would slant to one side making my roots look flatter; they were clipped as close as they could get to my scalp. What I did to keep the clips straight up was fold my hair at the root and then clip it. Sorry I forgot to take pictures of how it was set so....I DREW IT!! Yay! I hope you can see what I mean...it is amazing volume. I just need to make it neater next time and make sure my hair is fully dry because when I took the clips down my hair was slightly damp, BUT I still got awesome volume. I can't wait to see how it will come out on fully dry hair and maybe with some epsom salt spray gel!! !